We're giving away five (5) digital copies of Marvel Studio's Avengers: Infinity War, and all you have to do is provide your name, email and mailing address... No trivia questions, running through hoops, etc.. How easy is that? We'll select five winners (one copy per household) and send your digital copy via USPS. All entries must be received by Wednesday, August 10th at 11:59 PM EST, so act fast. Good luck! Synopsis: Box office history was made when Marvel Studios’ “Avengers: Infinity War” shattered all opening records, surpassed the $2 billion mark at the global box office in just 48 days, and remains the fourth highest-grossing film of all time. Now, the cinematic event ten-years in the making comes home Digitally on July 31 and Blu-ray on August 14 with over two hours of bonus. 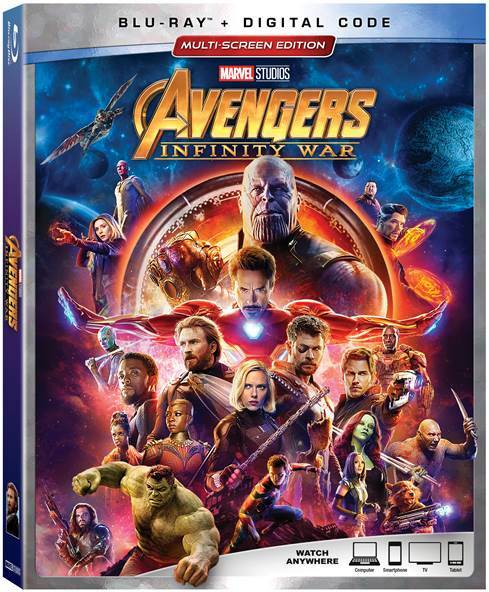 Avengers: Infinity War is available on Digital July 31st and Blu-ray/DVD August 14th. Click here to purchase online.